Ultra-cyclist, journalist and RAAM winner Danny Chew first met Jure Robic in 2003. 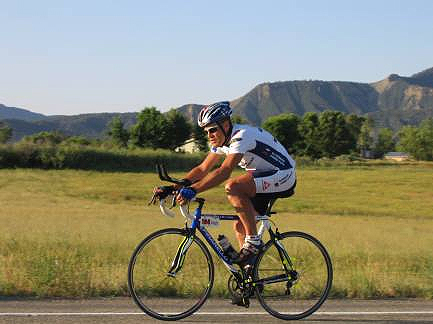 It was Robic’s first attempt at RAAM, which stands for Race Across America. It is a 3,000+ mile single-stage bicycle race from the west coast to the east coast (starting and ending cities change every few years). At a stop, Robic looked to Chew for some help: What should he do about the quivering in his legs, the rookie asked the RAAM veteran? Chew gave him advice but worried about the rookie, thinking the Slovenian soldier would not be able to maintain his pace and would eventually slow down on the final night before getting to the finish line. But Robic blew by the second place competitor, Rob Kish, and Chew learned Robic was capable of getting by on minimal sleep, a quality that’s critical in RAAM. 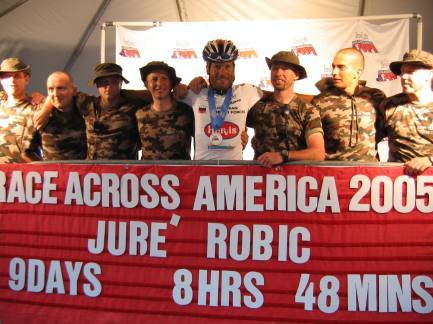 Robic maintained the ability to sleep just 60 to 90 minutes per day for his RAAM career, which eventually would include five victories (2004, 2005, 2007, 2008 and 2010) in what many consider the toughest race on the planet. Jure Robic, one of the best ultra-cyclists of all time, was killed by a car on Friday, September 24. He was on a training ride about five miles from his home in Slovenia on a mountain descent. Rest in peace, Jure. I first met Robic in 2005 when I covered RAAM as a journalist. With a steely determined gaze and a strong jaw, he looked like an Eastern European Lance Armstrong. And he had the same level of dominance. Riding with the crew who were filming a documentary that would turn into the film “Bicycle Dreams,” I interacted with Robic regularly. Stoic and serious, more often than not he’d indulge our questions while he raced. He was matter-of-fact and, to the dismay of the film crew, he wasn’t terribly interested in sharing his demons. There was a lot of them — demons, I mean — on the 3,052-mile race that year, especially for Robic, who slept around 10 hours total in over a week of racing time. Hallucinations are part and parcel of the race, and Robic was known to weep uncontrollably during the final few days of the event. He would hop off his bike to fight imaginary assailants, which were actually mailboxes. And when he was really raging, he could lash out against his crew. What would these fellow Slovenian soldiers do? Lock the doors of the follow vehicle. Most cyclists know about good days and bad days on the bike. But seeing Robic doing battle with these demons year after year makes the word “inspiration” feel woefully inadequate. Because winning a battle with the deepest internal demons is not always possible, simply persevering means success. Robic did it again year after year. And seeing him smile on the tail-end of a question or in between battles was akin to seeing footage of notoriously depressed poet Sylvia Plath crack a pure and unabashed toothy grin of joy. I still think about that from time to time. It’s both infectious and otherworldly. It makes me smile but more importantly gives earthy evidence that just about anything is possible through perseverance. For that insight I am immensely grateful. Goodspeed, Jure. Thank you for showing your fans that limitations are man-made and overcoming them ain’t pretty but is indeed possible.